Clearly, I wasn't the only one who had a busy month in November. I received several emails last night with November finishes! Debra B. was an early-bird finisher, though. Here are two finishes from Deb. First, Asian Nights, my #3 UFO, is from Harriett & Carrie Hargraves, Quilter's Academy - Volume 1 - Freshman Year, book. I purchased both the freshman and sophomore years because "thru the grapevine" I heard the "academy" books were written for beginner thru advanced quilter's and will make everyone a much better quilter. I find the books very informative and when I find a quilt I really like, I flag it and it becomes one of my upcoming UFO's. Deb, I can tell you've taken Harriet's instruction to heart. Beautiful work! I also have two others that I made. 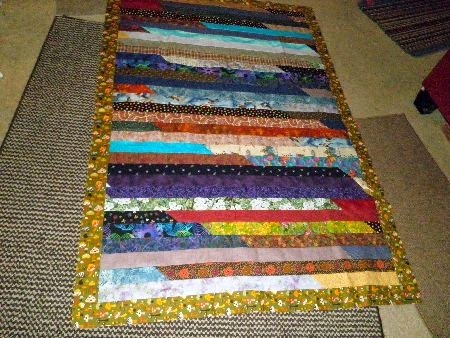 I made jelly roll quilts (not really jelly rolls - just 3" strips of stuff that's laying around that I wanted to use up). I love the doggy treats in the second photo. I can't believe the dogs let the treats lie on the floor -- mine catch their treats in the air and finish them in one bite! 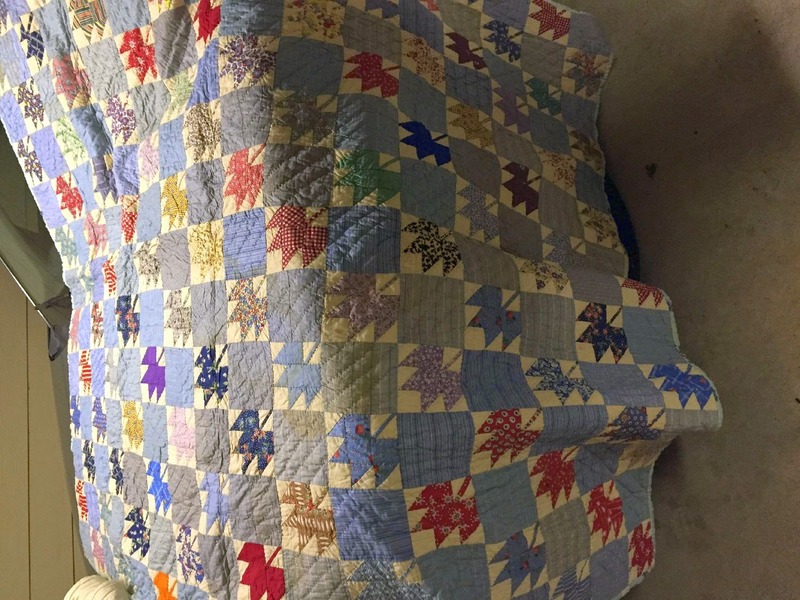 Heather finished not one, not two, but three charity quilts this month! She tells about the recipients in her blog post on Peachy Pages. Heather, you've made some soldiers and their families very happy, I'm sure! Oh, look! Debra also sent photos of this clever wool project. Deb's guild, Sunshine Quilter's of El Cajon, enjoyed a workshop with Kathy of The Cottage at Cardiff Farms. 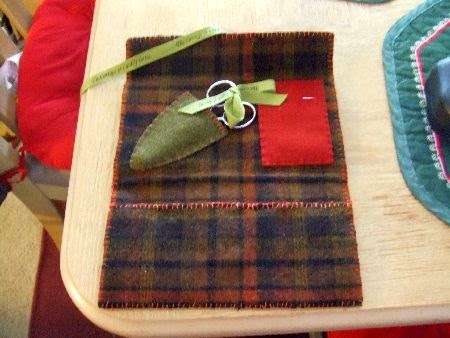 They made these darling wool "stitcher's clutches." 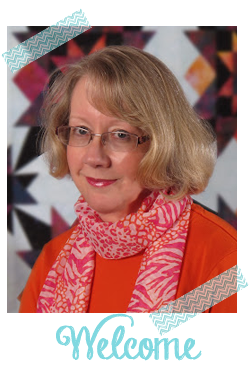 Deb, I have one of Kathy's books, "The Cottage at Cardiff Farms Quilts," but I didn't realize she also did wool patterns. 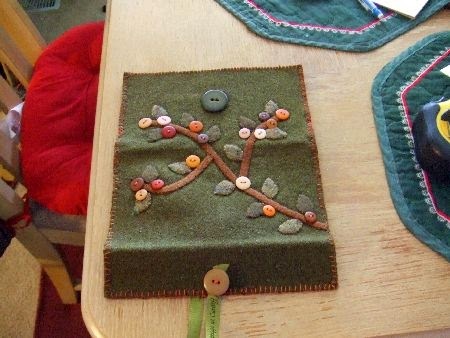 Darling, and I can't wait to see the pin keeps (cushions) you make in December! 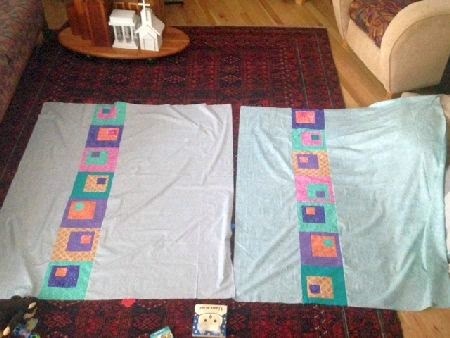 Friend Martha in Idaho is making baby quilts again! She reports that the parents have a "beach" theme -- don't you think these quilts will fit perfectly with that? 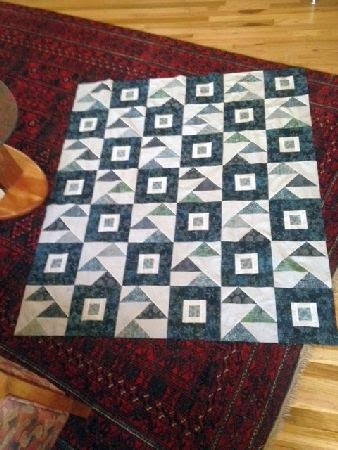 Martha also finished this "Staggered Geese" quilt, a scrapbusters projects from my favorite Boise shop, Quilt Expressions. She reports a new method to make Flying Geese -- can't wait 'til I visit Idaho again to learn this technique! 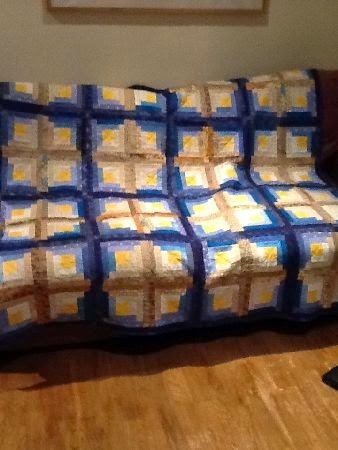 Sue about "quilted her fingers off" to finish this beauty by the deadline of her brother's 60th birthday. Isn't is gorgeous? I have to show you the back so you can really see the heavy quilting. 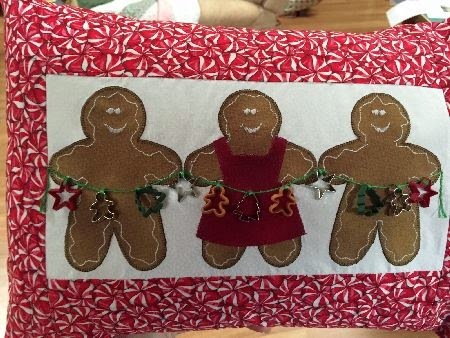 Wow, Sue -- I bet your brother loves it! 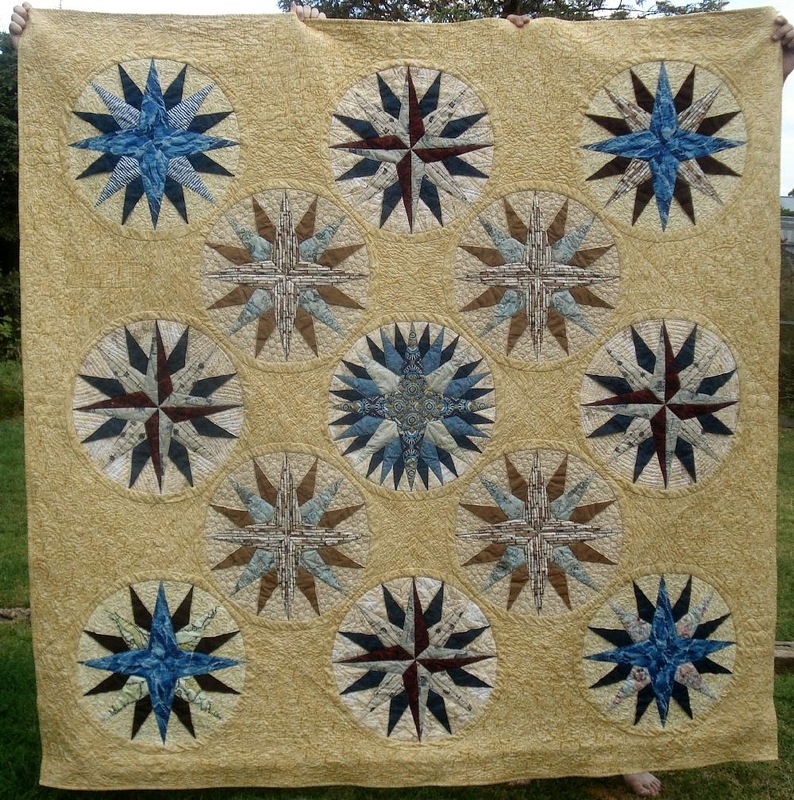 More details about Coastal Compass on Sue's Quilty Bits and Bobs. Joy, I love it with the bright colors! Mary finished her entry for the Michael Miller Modern Quilt Challenge. This challenge required the use of several MM pastels -- not always what I think of when I imagine modern quilts. I think Mary did a great job making these fabrics look "modern!" Here is the beading on the focal star -- click on the photo to see it close up! 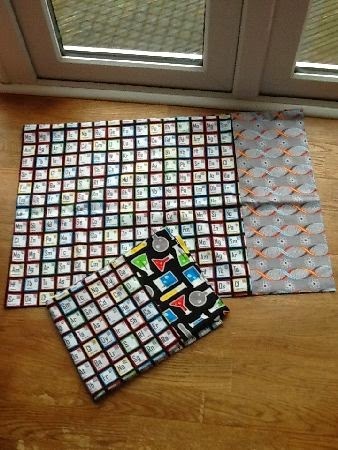 Read more about Mary's challenge on her blog, Zippy Quilts. Gill really hit the finishing jackpot this month! Just look at all these finishes (and that's not all)! 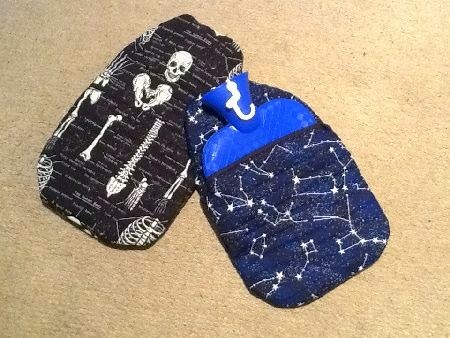 I love these hot water bottle covers! What a great gift idea for chilly UK winters! 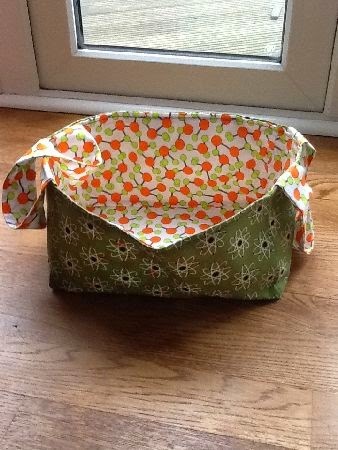 She calls this a "fabric tidy box." Cute, huh? I need to make some of these! 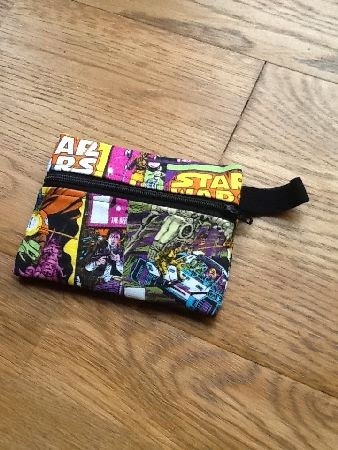 And one can never have too many Superhero coin zipper bags! 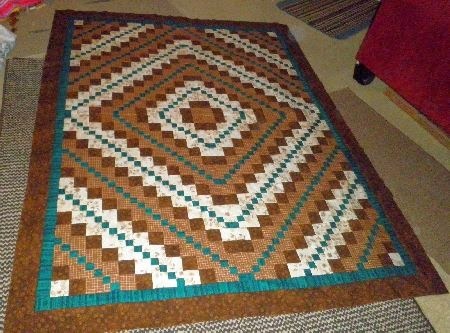 Her "big" finish this month is this log cabin throw for her father in law. Looks like you're ready for the holidays, Gill! 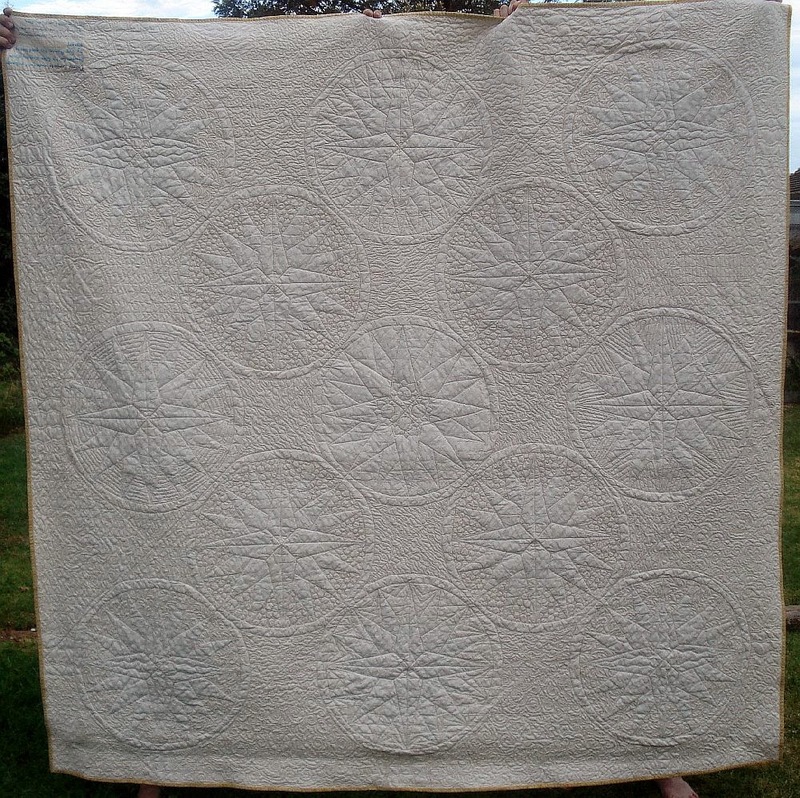 She was an avid quilter and hand worker, and I have many pieces that she made for me. She is really where I learned to crochet, embroider, cross stitch, and latch hook. 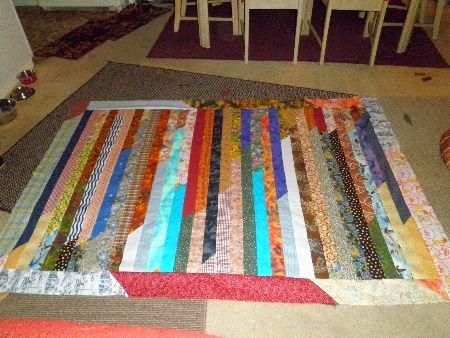 Since then, I have learned to machine sew and quilt, and she was always a big fan and supporter if my work. . . . I did think of you last week as I was cleaning out her linen closet and came across this quilt. It was hand pieced and quilted. I will assume that it was completed by her, but it very well could have been made by my Great Grandmother. I share it with you, knowing that you will appreciate all of the work and love that has gone into it. 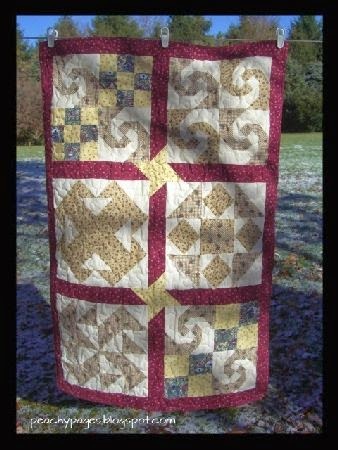 Joy's treasure is the block pattern for the Autumn "A Quilt Block a Day." This is indeed a treasure, Joy. I hope you'll have it appraised, and buy a non-acid box to store it in! Enjoy your holiday preparations, and I look forward to the last 2014 UFO Parade on New Year's Day 2015! Wow, some over achievers there, with multiple projects finished! Well done everyone! 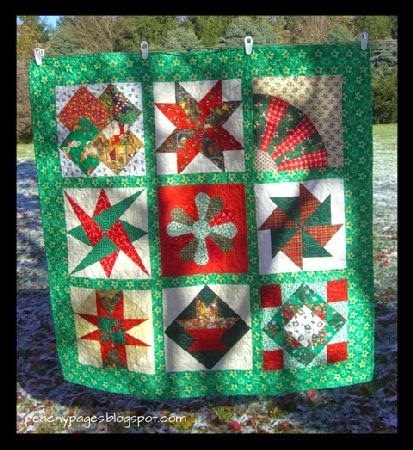 I just love Joy's Quilt Block a Day quilt as I really love bright colours but the antique quilt is absolutely gorgeous too. Good luck to everyone on finishing their December project, I've pretty much already kicked mine to the kerb as there are too many things to get done by Christmas. I've also put all my potential UFO's in one box but I think I'll need extra months in 2015 (and a bigger box) if they're going to get done anytime soon. Thank you, Sooli. 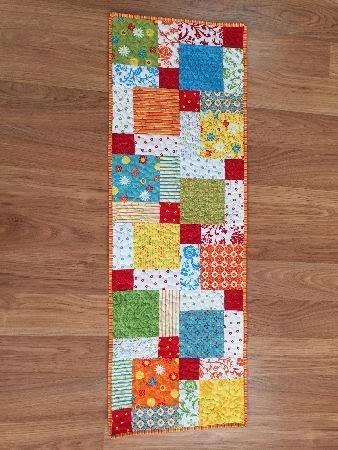 I enjoyed the Block a Day, and it really improved my piecing. With much more practice, I hope to be as good as my grandmother one day. Thank you for the kind comments about her quilt. Good luck with your UFO's...you can do it! Those are so creative and fun. It shows us how versatile a jelly roll can be. What a fabulous quilt show in this post. Thank you, Marti and congrats to all the finishers. What inspiration this month! I really like the Staggered Geese from Martha. After knee surgery and recovery in September and October and new carpet in the whole upstairs (which included my sewing room!) in November, I am living through everyone else's projects now. Slowly putting my sewing room back together, but the machine is still not available. May 2015 be a more productive year! Irene, hope you're recovering from the knee surgery and I'm looking forward to seeing what you make in your newly refurbished sewing room! What fun variety in the finishes this month! It inspires me to get going and get some finishes of my own done in December! 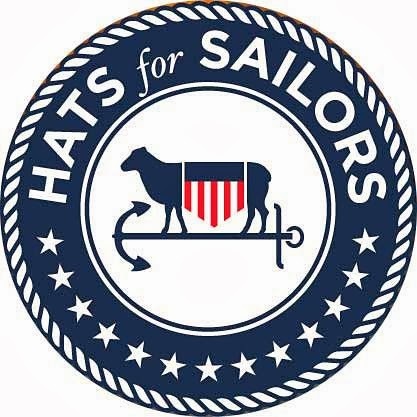 Great show this month! 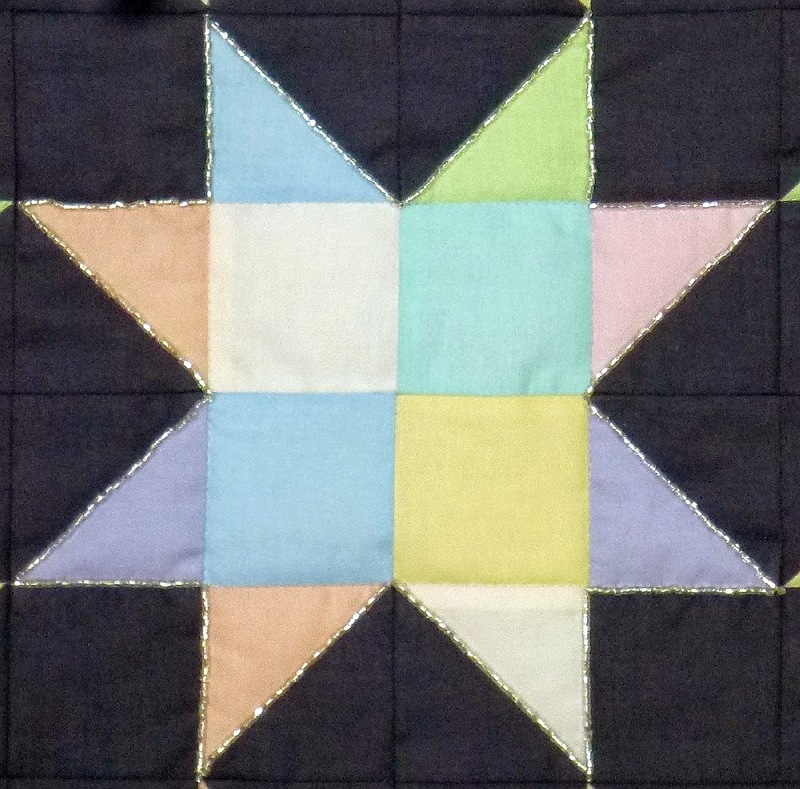 I especially love the sampler quilts and the staggered geese...but the compass! Oh my! What a beautiful quilt! Sue's brother is a lucky man! Good luck with December finishes, everyone! 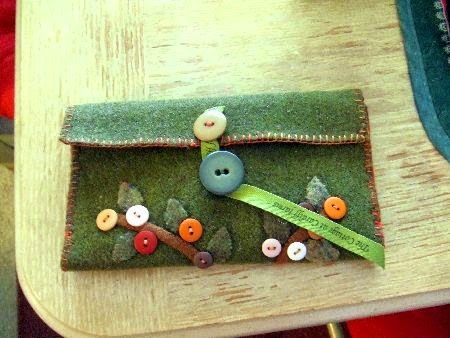 I love the woolly wallets, and that 60th birthday quilt is stunning! 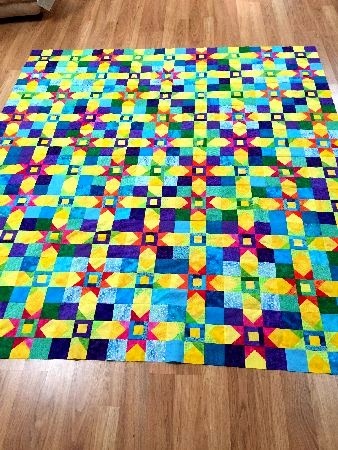 what a wonderful showing - Sue did a great job on her brothers quilt and I really love the bright one from Joy (in Nashville). 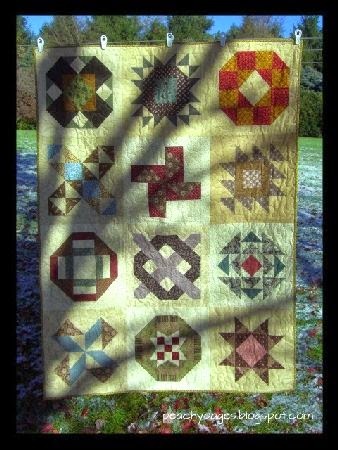 I love the radiant colors in Joy's "A quilt block a day" quilt. I also like the title - good idea!